So the day came to leave Vietnam and head for Cambodia via the Mekong Delta. We started off the trip with a bus ride to Cai Be. From there we hopped on our first boat which was to take us along the Mekong through a floating market, which was made up of lots of boats all floating in the middle of the river selling all sorts. Most boats advertised their stock by hanging some samples from a tall bamboo stick at the front of the boat. After the market we went on a cruise along the river and ended up at a village where we jumped off the boat and onto bicycles for a short ride to a house where we had lunch before cycling back to the boat and heading for Vinh Long. 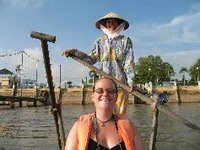 Once at Vinh Long we got back onto a bus and then a ferry to Long Xuyen. The fellow ferry riders seemed very amused by us and kept looking at us like we were all aliens or something. The itinerary for the trip said that we'd be at our hotel for sunset i.e. 6pmish however we seemed to be running very late and only made it onto the final boat for sunset. So we sat on the top of the boat and watched sunset while chatting and having a few beers. We finally took off and got to watch a lightning storm as we headed slowly along the river towards our stop for the night at Chau Doc. We had dinner on the boat and finally got to our hotel at 9.30pm. The hotel was pretty basic and we had a horrible nights sleep as it was about 35 degrees in the room. The next morning we were up early to continue our trip after grabbing some brekkie. We jumped on the bus for a quick trip down to the water where we jumped into little boats which were only for 2 people and which we manned by a local person who rowed us along the river. We rowed through a floating village and stopped to see and hear about the fish farming that was done there. We then went to a Cham village where we got out of the boats and spent the last of our Vietnamese dong. We got back into our little boats which took us to another bus. After a short trip we boarded a small and very warm boat which was to take us on a cruise to the border and on into Cambodia. The border crossing was easy and before we knew it we were in Cambodia floating along. Once our cruise was over we were to get onto our final bus which was to take us to Phnom Penh. However we were again running late and thanks to brilliant organisation on the tour companies part - we didn't all fit on the bus. Basically they had a minibus which had enough seats for the number of people but neglected to take into account that everyone was carrying backpacks which of course took over 5 seats. So after lots of negotiation the extra people got a car to Phnom Penh and the rest of us had a very squashed trip in the mini bus. It was a really long day so when we finally got to our hotel in Phnom Penh at 7 and were told our room had been given away we were not very happy. Thankfully they had a room in a hotel just down the road which we gladly took. That night we were wrecked so just ate in the hotel, booked our bus to Siem Reap for the next day and crashed out. We caught our bus to Siem Reap and arrived to the most hassling I've ever experienced. We could barely get off the bus for the amount of Tuk-Tuk drivers that were trying to get us to take them as their driver or stay in their hotel. It took every bit of restraint I had not to shout at them but eventually we found a Tuk-Tuk who would take us to our chosen hotel. Our Tuk-Tuk driver's name was Nee and once he'd dropped us off at the hotel we arranged for him to collect us later that afternoon and bring us to the temples for sunset. What a sight Angkor Wat was as we pulled up just as the sun was beginning to set...it was huge and we happily spent an hour wandering round taking photos before darkness fell and we returned to the hotel. We made further arrangements with Nee to be collected the following morning for more temple viewing. 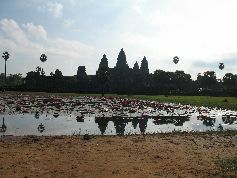 We jumped into the Tuk-Tuk at 8 the next morning and headed back to Angkor Wat for a longer stay. Its really amazing and climbing up to the top of the towers was great although not for those afraid of heights! After Angkor Wat we headed for Angkor Thom which has several temples in it as well as other wonderful structures. We saw Bayon, Baphuon, Phimeanakas and Preah Palilay temples and also the Terrace of the Elephants. After doing all that walking we grabbed some food before heading to our last stop of the day - Ta Prohm. Ta Prohm is where TombRaider was shot and seriously reminded us of Indiana Jones - so much so that I continually hummed the theme tune as we clambered over the fallen rocks. I think Ta Prohm was my favourite of the day. That night we just relaxed round the hotel. The next day we had scheduled in another few temple visits with Nee. We were in the Tuk-Tuk at 8 and off we went on a lovely hour long ride through the countryside to Bantreay Srei temple which is famed for its carvings and once you step inside you can see why. The walls were covered in incredibly detailed carvings which were gorgeous. Once we were done standing and staring at the carvings we jumped back into our Tuk-Tuk and headed back for town. Enroute we stopped at Pre Rup temple. This wasn't one that we'd heard of but since we were passing we thought we'd pop in and wow were we happy we did. Once we climbed the zillion steps to the top the view was amazing. It looked like you were in the middle of the Amazon...its was breathtaking and we couldn't believe that no-one had mentioned it to us! We left Pre Rup and headed back towards town to stop at the Landmine Museum. The Museum was set up by Aki Ra who has spent years removing landmines from the Siem Reap area and his museum helps this cause. We had a guide named Hak who was a landmine victim himself who had not only lost his leg to a landmine when he was young but also his older brother and sister to the same mine. It was a humbling experience to hear him talk about it and then show us all the different devices and how incredibly hard they are to see when positioned in the ground. There have been 40,000 amputations since 1979 and there are still up to 6 million landmines left in Cambodia. We headed back to the hotel for lunch and a short break before Nee collected us for another sunset trip - this time to Phnom Krom, a hill over looking Siem Reap Lake. After eventually finding our way to the top of the hill we sat and watched the sun set over the lake which was lovely. Afterwards we headed back and said our thanks and farewells to Nee who had been a great driver for the last few days. After having a few very busy days we decided to take a rest day and just relax in Siem Reap. We wandered round the market and then headed to an internet cafe to update the blog. We had a few cocktails that evening before booking our bus to Battambong for the next morning. The bus trip to Battambong was very hot and sweaty but we finally got there and jumped on 2 motos (mopeds) to get to our hotel. We checked in and had some food and relaxed for the rest of the day. The following day we wandered round the markets and met an Irish guy who had been on our bus the day before. He informed me that the temples and the palace (the only main sights in Battambong) were both closed and so there wasn't really much to do so we just chilled out and booked our bus to Phnom Penh for the next morning. We arrived in Phnom Penh in the afternoon and grabbed a Tuk-Tuk to our hotel. After checking in we grabbed some food and sorted out a city tour for the following day which would bring us everywhere we had wanted to go. The next morning the mini-bus picked us up and brought us to our first stop, Tuol Sleung (S-21). It was a prison and is now a genocidal museum showing photos of some of the thousands of people to have been kept there who never left and also some of the rooms where 14 bodies were found after the regime. It was pretty harrowing for first thing in the morning and really got to you...only a few of the 14,000 people who were put in there survived! After that we headed to the Killing Fields which us where the Tuol Sleung prisoners were brought to be executed. They have built a memorial to those who died there and inside you can walk around a glass tower filled with 8,000 skulls from victims whose bodies had been disinterrned. All around the memorial were the now empty mass graves where all the bodies had been found as well as land underwhich some graves still lay. Our next stop was at the Russian market in town where we had lunch in a little cafe on a corner before wandering round the market and buying a few bits and pieces. The next stop was the Royal Palace. We weren't sure what to expect but once we walked into the grounds we both just went wow at the beautful gardens and gorgeous golden edged buildings that surrounded us. Within the Royal Palace is the Silver Pagoda - so called because it is floored with solid silver tiles each weighing 1.5kg which also contains a jade buddha. Once we'd finished gazing at the buildings and fabulous surroundings we headed back to the hotel. We went up to the rooftop bar and watched an amazing sunset over the lake while having a few drinks. The next day was our last in Cambodia so we went to both the Central and Russian markets for some last minute shopping before grabbing dinner on to roof of the hotel and packing our bags for our early flight to Bangkok. We got up at 6 and after grabbing some take-away brekkie we jumped into a Tuk-Tuk and headed for the airport. We were off to the final country on our trip - Thailand.